Earlier this year we saw there release of an Indonesian western in Marlina the Murderer in Four Acts (trailer) and now we have another western from an unlikely country: Singapore. 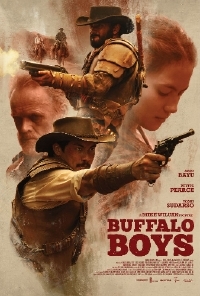 Buffalo Boys is the directorial debut of Mike Wiluan, an actor and producer behind Crazy Rich Asians, Hitman: Agent 47 and Headshot. The movie unfolds in 19th century Java. When the sultan is murdered by Dutch soldiers, the sultan's brother and two infant sons manage to escape to America's Wild West. Years later, the boys return to Indonesia to avenge their father's death. The trailer for Buffalo Boys plays like an all-out, Django Unchained-inspired, western complete with machetes, guns and bucket loads of action. Count me in! Buffalo Boys opens January 11.